So I’ve tried to avoid the worst of the plastic (though there were a couple of items that were necessarily plasticky, such as the camera) and I’ve also tried to include ideas for all budgets. As with the men’s guide, many of the things I’ve included are intended to be more of a springboard to other ideas – an introduction to a new brand, perhaps, or a suggestion for a certain type of toy or book. But let’s get started shall we? As with the previous gift guides, please leave your own ideas and suggestions in the comments box below. There have been some great ones! 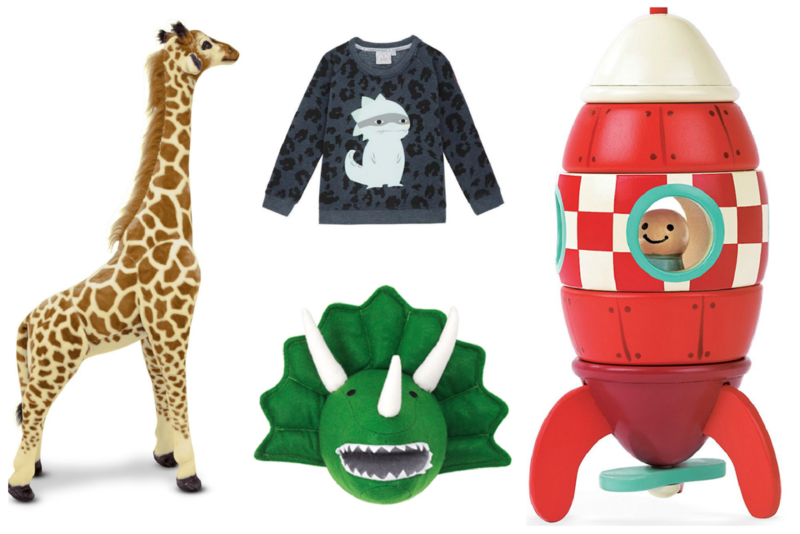 I love this magnetic dress-up play set – £11.99 at Amazon here* and have to say that I have something of a soft spot for Scamp & Dude’s beautiful sweatshirt designs, stocked at Liberty here*. Angelica and Ted have this plastic-free (just about!) Doctor’s set – at £35.60 it’s a lot pricier than many of the sets out there but the pieces are just lovely and they come back to them again and again. I absolutely think that wooden play sets – food, tools, etc – are worth the investment. Find this one from Le Toy Van here*. More from Le Toy Van; this little tool bench with loads of tools to make noise with and scrape along your kitchen woodwork is £72 here*. And for the retro lovers amongst you, the Sonny Angel special edition Christmas series is out – figures are £7.95 at Retro Kids here. I’ll be getting this Build a Beetle game for Ted and Angelica, even though Dexter the dog eats just about every single piece of every game we buy. It’s just £4.99 at Amazon here*. And the little wooden car is just gorgeous – I’ve considered buying it for the past couple of years so this is probably the moment! It’s a Budkins toy, £24.95 here*. In fact, the reason I don’t have the car is that I bought this magnetic rocket instead – Angelica loved snapping the pieces together when she was smaller and, if I could find the bloody propeller, Ted would love doing the same now. It comes in different sizes, starting with the small which is £14 here*. 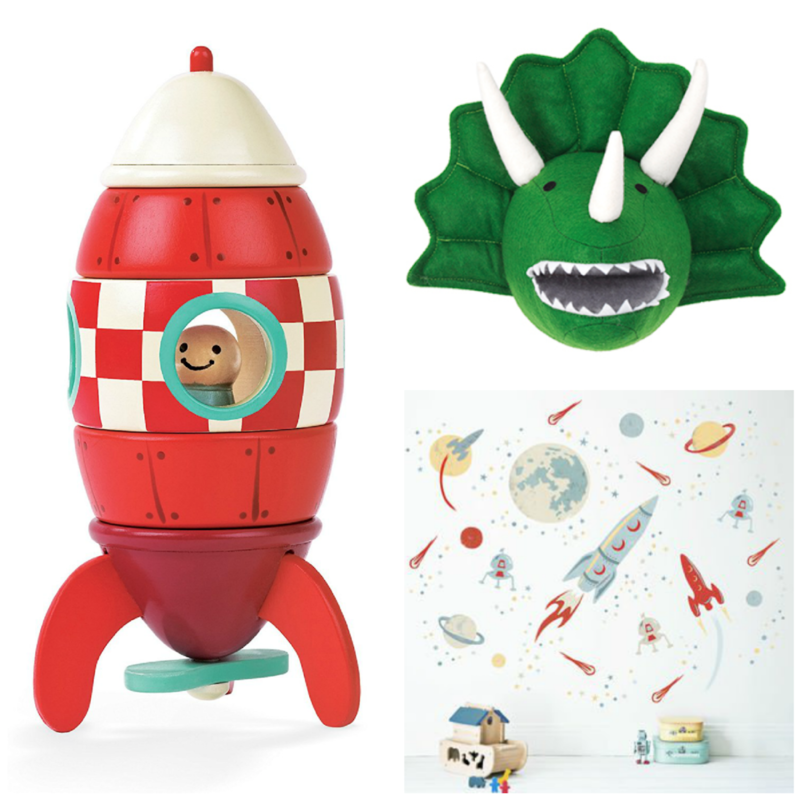 The cool dinosaur wall decoration is £10 from Sainsburys and the gorgeous rocket wall stickers, which cover quite an expanse of wall, are £45 here*. Liberty’s pre-packed Christmas stockings are absolutely brilliant. They do a few different options, but each contains items worth far more than the sale price. This one is £75 here*. 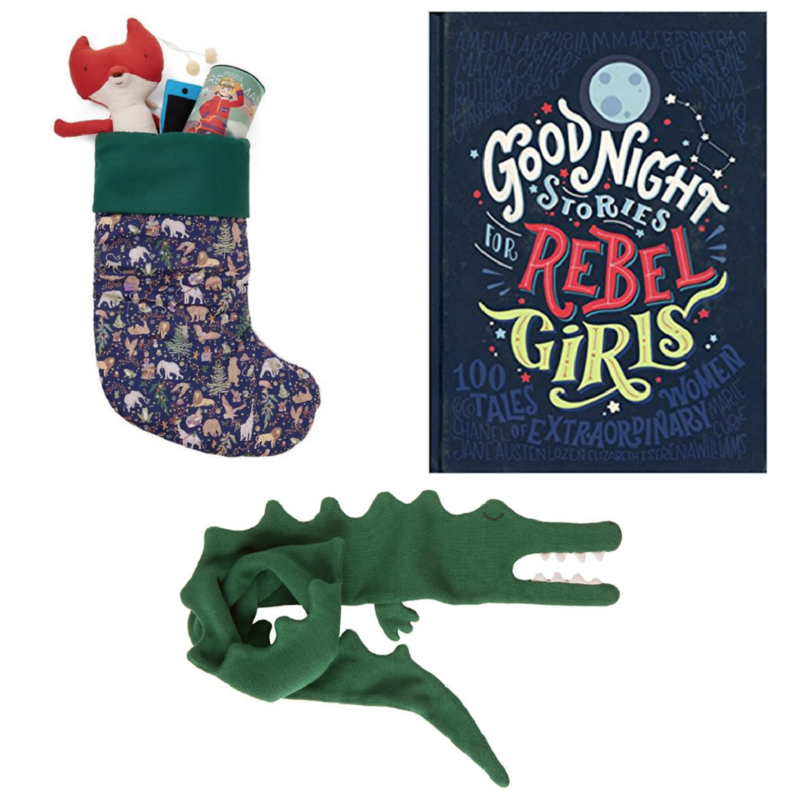 Good Night Stories for Rebel Girls is fast becoming a cult book buy – it’s £12.80 here* – and this amazing alligator scarf (I’m tempted to buy for myself) is £32 from Spotty Herberts here. More space adventures with the wonderful Spaceman soft toy from Storklings – £15.99 here – and the PonyCycle, which is a ride-on toy pony that actually moves (sort of) like a pony is £189 at Amazon here* or £179 at Smyths. If you’ve never seen one in action before you have to go and watch the videos, it’s so brilliant! 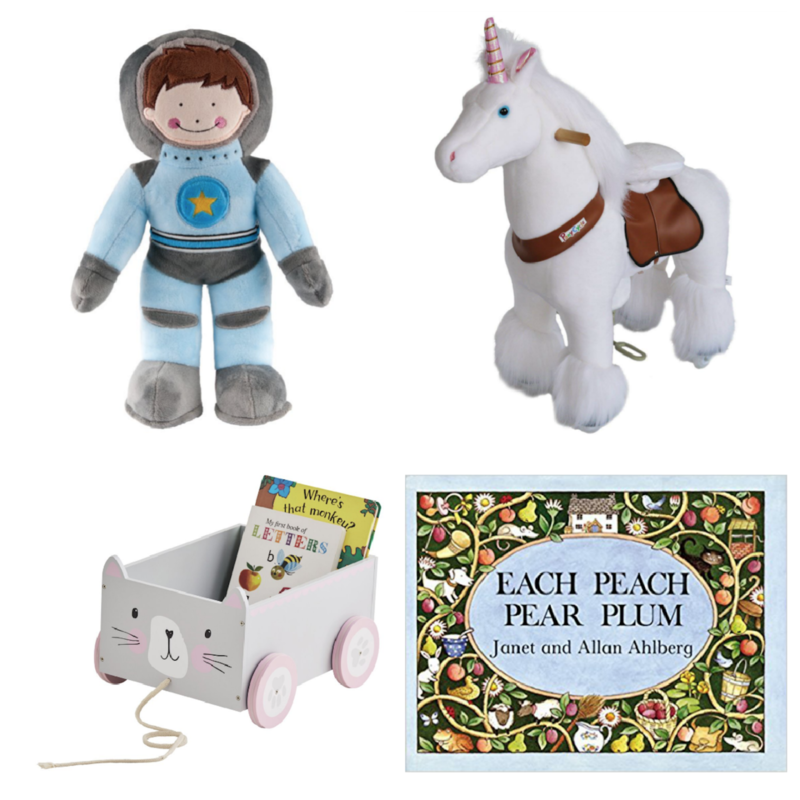 Each Peach Pear Plum is a bedtime favourite in our house – the hardback is £5.40 here* and the cute wooden book cart is from excellent toy-makers GLTC, here. 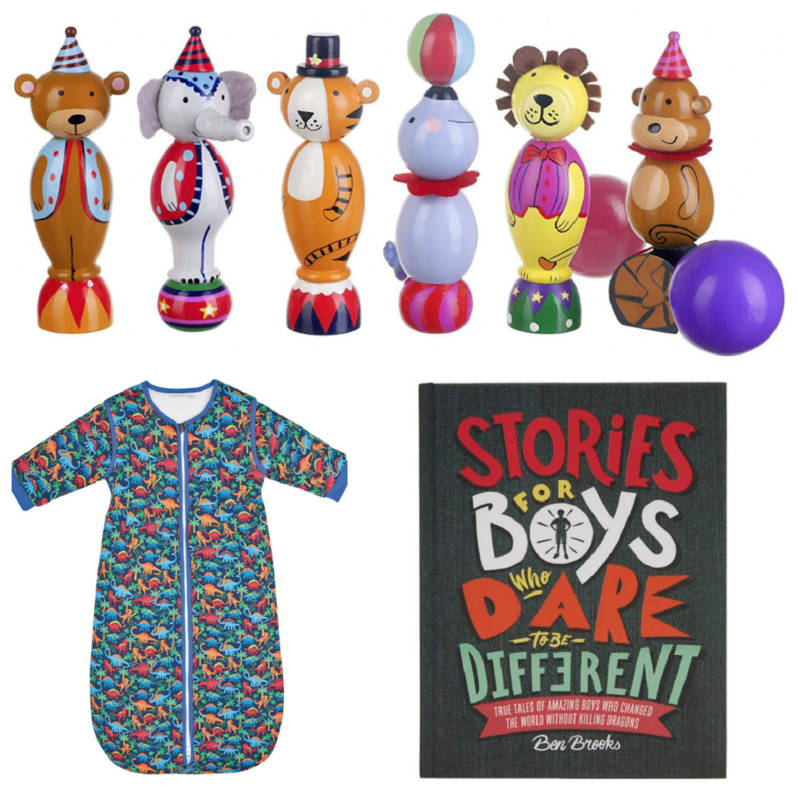 These wooden circus skittles are quite dinky but perfect for tiny hands; £16.95 here*, and the Stories for Boys Who Dare to be Different is another cult favourite, £17.99 here*. 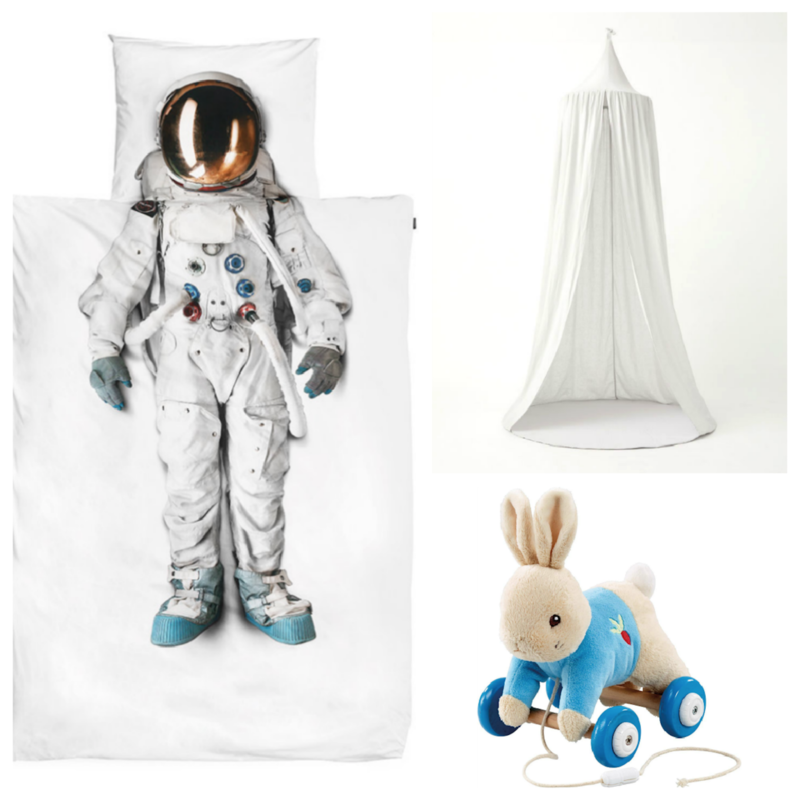 The sleeping bag is a fabulous buy if you worry about the winter months and keeping your tiny ones warm; it’s a whopping 3.5 tog and has arms, so if you live in a freezing cold, old house then you know what to do… It’s £35 at Jojo Maman Bebe here* – remember you get 15% off with the code AMR82 until end of 2nd December. More wood! We have this play food and it gets used every day, time after time – we also had some very cheap plastic stuff and that gets ignored, so I know which one was the sensible buy. 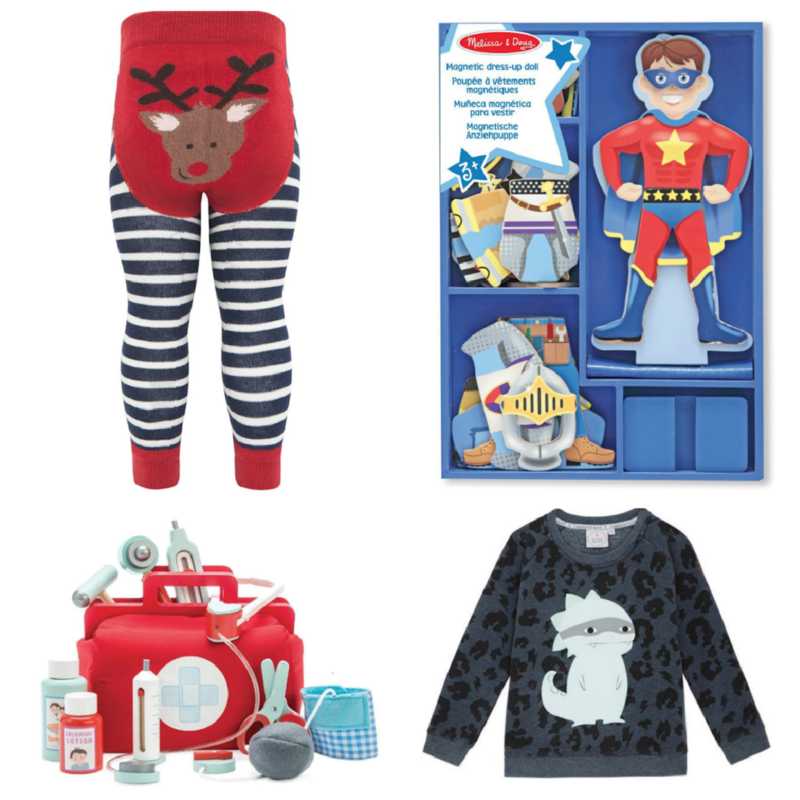 This lot is by Melissa and Doug, £15 here*. 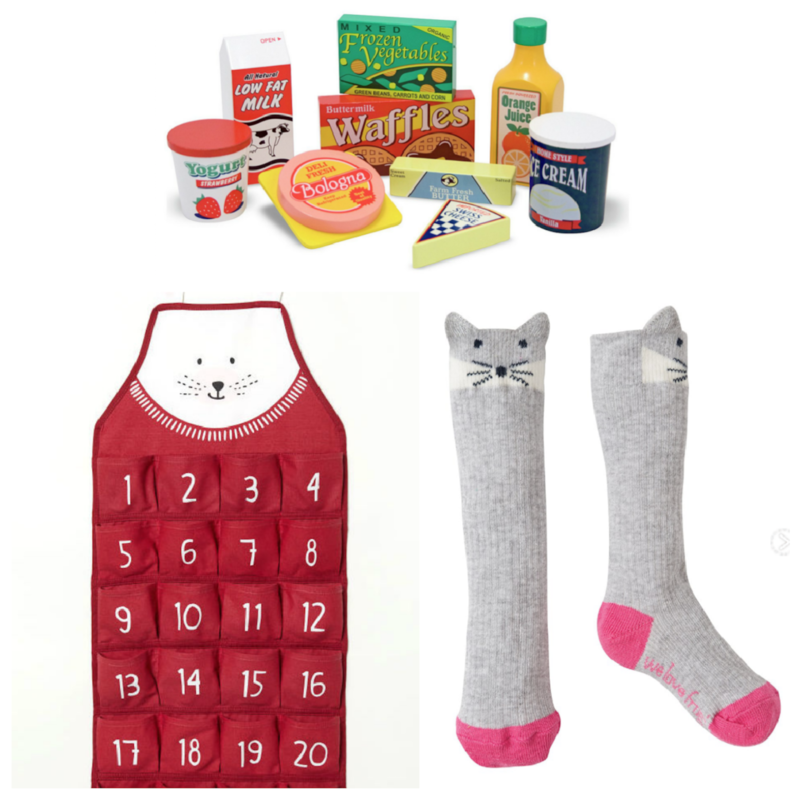 The sweet little knitted socks are from Frugi, £6 here and the wall-hung advent calendar is a great idea. It can be used year after year and costs £14.99 at H&M here*. Sorry, a bit of an indulgence; the wooden scooter from Janod is pricey but excellent. It’s actually a balance bike, not just a toddler ride-on, but surely must be the coolest balance bike around? It’s £102 here*. We have the giraffe: it’s huge. Once we had managed to persuade the kids to stop trying to ride on it (I came in to find Angelica standing on a chair in an attempt to mount its back) it looked very splendid in its corner. Every day giraffe seems to wear a new hat/neckerchief/blanket; it’s the gift that keeps giving and would jazz up any nursery! It’s £67.99 here*. The Christmas Liberty bib is a posh little gift for a new baby – £15 here*. Another star buy from GLTC; the Sugar Cube play kitchen is solid, realistic and one of the most attractive toy kitchens I’ve seen. It’s £88 here. This dino lamp from A Lovely Little Company (they do so many gorgeous little lights) is £13 here*. The Crazy Faces magnetic game is by Janod, £16.95 here* and the camera is one I’m looking to buy Angelica. I’m just finishing off my research because the VTech gets good reviews too, but that one needs 4AA batteries and batteries are the bane of my life. This one by UpGrow, costs £31.99 and has a rechargeable battery. Sounds great to me… It’s here*. The excellent Snurk duvet set is more than a little pricey, but if you’re after novelty linen then this is the brand to turn to; find it here* online. Here’s an idea; zone off part of a bedroom (even a living room or study) to create an instant reading nook or hideaway. There’s something incredibly romantic about canopies like this – I’d like one myself! This linen one is £79.99 at H&M here*. Peter Rabbit looks as though he’s about to be treated in unspeakable ways, here – why’s he bent over double and strapped to two poles? The mind boggles. £15.95 here*. I love this Red Riding Hood hand puppet set, £19.99 here*, and this wonderful dolls house comes with everything except the figures. It’s £219 at Smallable here. 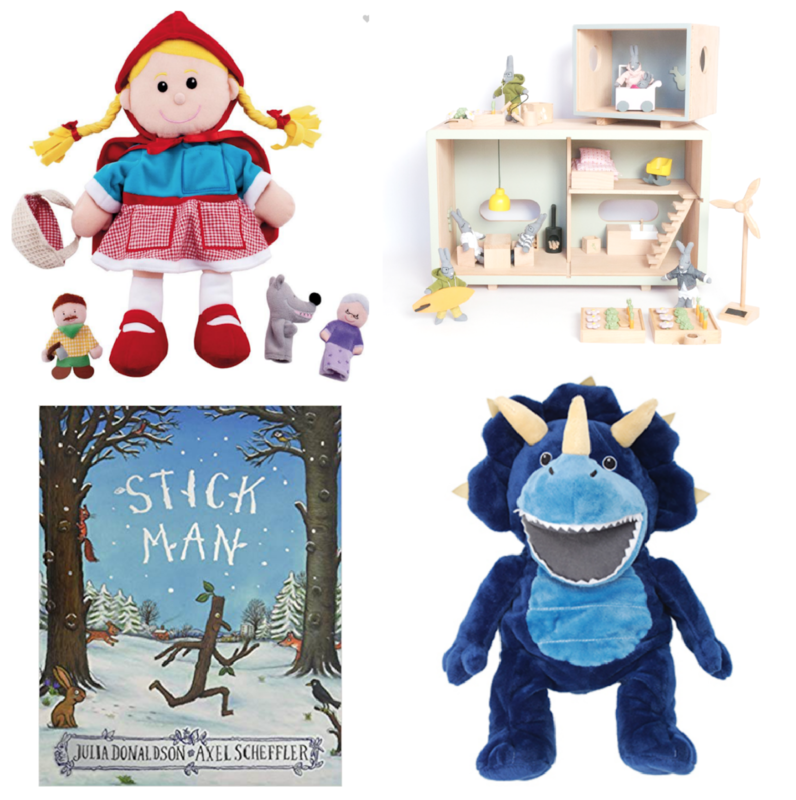 The dino hand puppet is £7 at Sainsbury’s and Stick Man (such a good bedtime story!) is £4.61 at Amazon here*. Lastly, we have the world’s best ever height chart (it’s a giant, solid oak ruler! 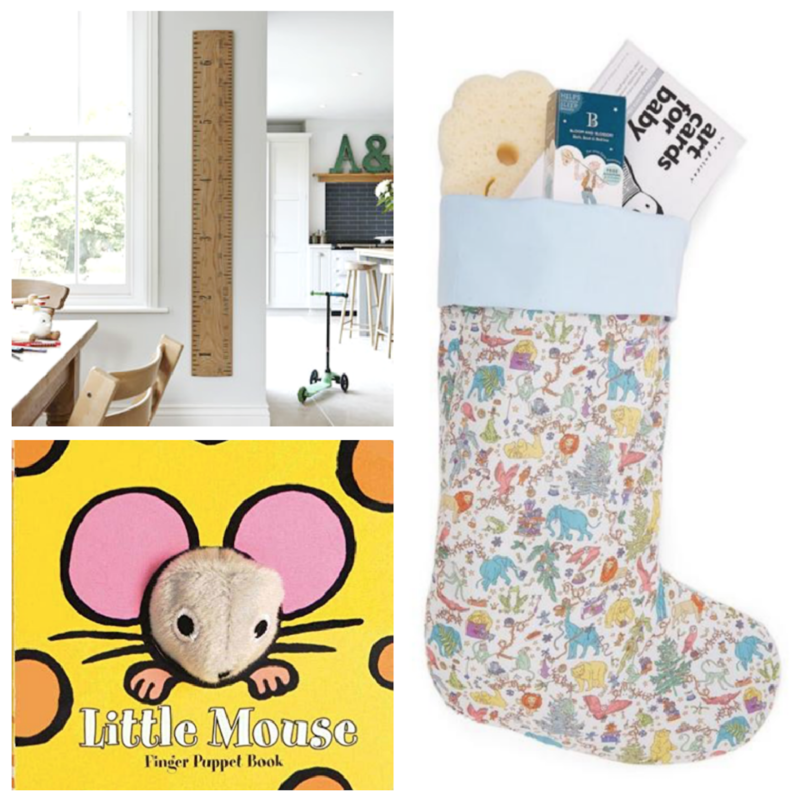 ), £255 here*, the baby version of the Liberty stocking (couldn’t resist featuring it twice) and the Little Mouse Finger Puppet Book, £4.99 here*. Hi Ruth. Thanks for the lovely suggestions and introduction to some lovely brands. I love the Janod stuff! I got a play ice cream cart as a birthday present for my 3 year old niece over the summer, which has proven to be exceedingly popular with young and old! I confess I went with the Leapfrog one which is as plastic as you can get, but i remember seeing some beautiful wooden ones when i was researching. Thanks for sharing such a great post. 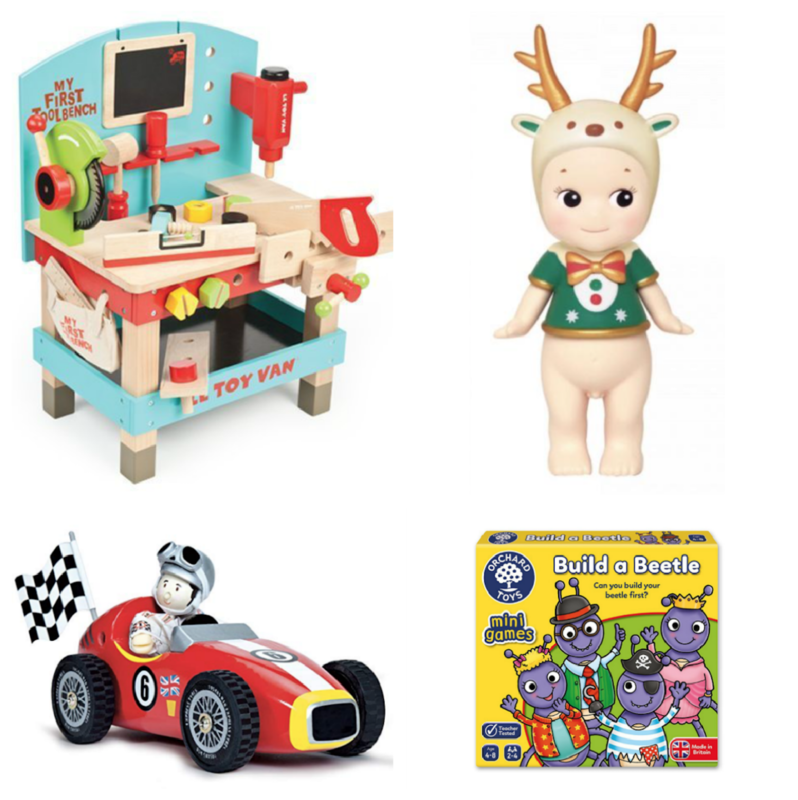 These are all great ideas for giving gifts to kids that surely they loved. Lovely ideas . But more suited for toddlers than kids . That is incredibly helpful and has given me a ton of ideas. Thank Ou! 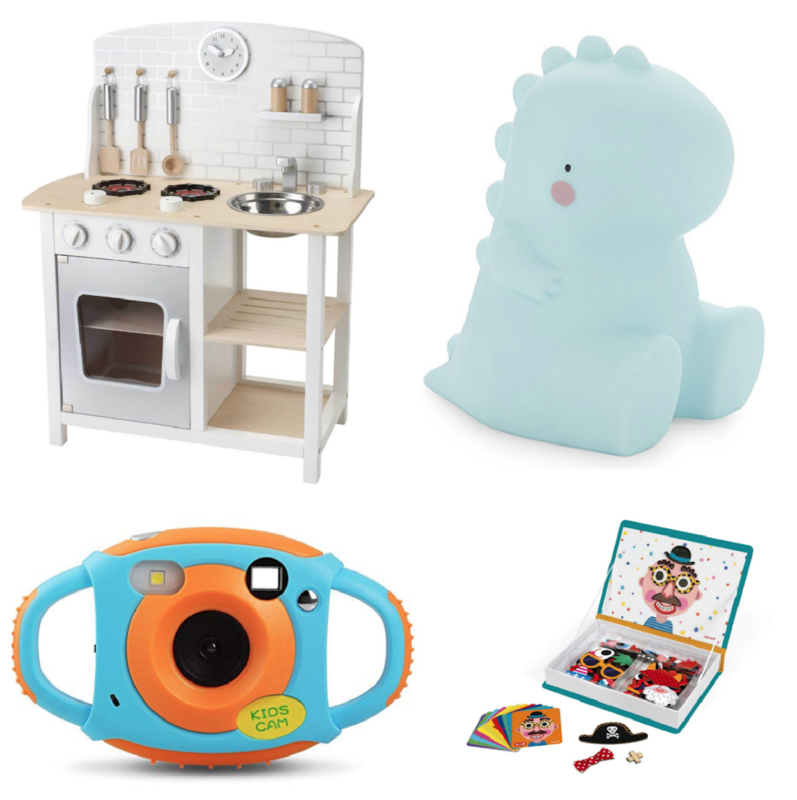 Very good job with this gift guide series. Love them. Oh these suggestions are just fab! 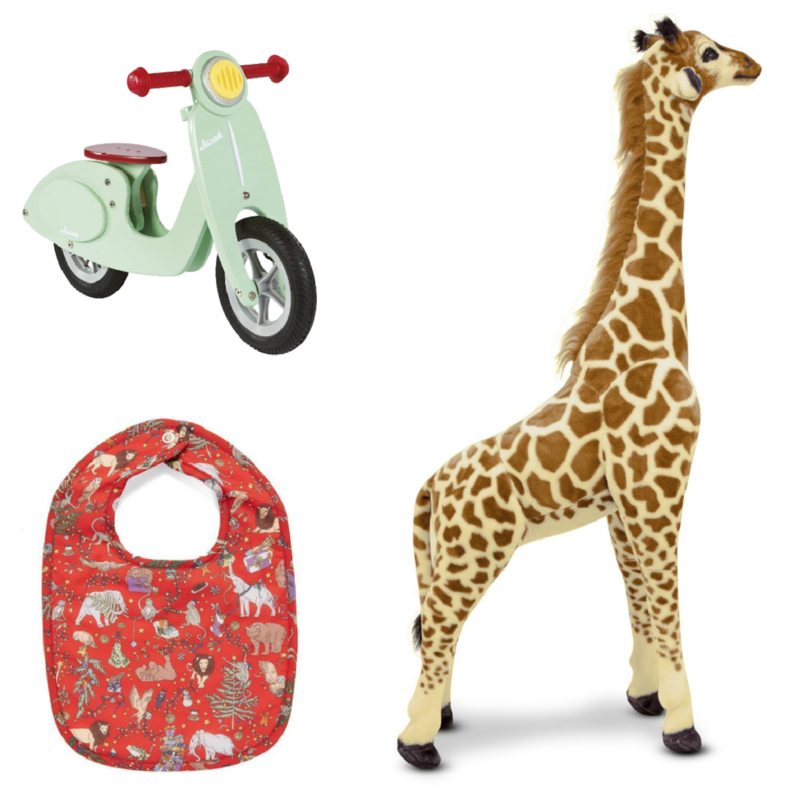 Was my little girl’s first birthday last month so have been struggling for ideas for Christmas. The little cat book storage is adorable. I’ve bought the UpGrow camera! I need to actually get it out of the box and have a look as it’s suspiciously light. Love the new theme Ruth, the site looks fantastic. Makes me wish I still had small kids to buy presents for. Our nieces are in their mid twenties ….. so there is still hope for having babies in the family again. Concerning the camera: I would always choose the rechargeable option. For one I do like to think that this is at least a bit more environmentally friendly. Plus I am the person that never has the fitting batteries at hand when they are needed most. An even bigger plus for me is when the thing is rechargeable via USB – no fiddeling and trying to get the batteries out and in again constantly. Yes, I have to admit I might be a slightly lazy person.